1964 182 SID Survey (Part 2) | Tennessee Aircraft Services, Inc.
Last month we started working through the new Special Inspection Documents that were added to the latest revision of the 100 Series Service Manual. This month is a continuation of the SIDs review. This is not intended as a comprehensive review but rather just some notes and highlights of the individual SIDs. I used to feel the nose gear was a weak link in the Cessna single engine airframe design. The fact that the very first CPA Tech Note is about nose gear shimmy seemed to support the thought as well. I now believe the reality is the nose gear just incurs so much stress and strain that it just doesn’t have a chance. 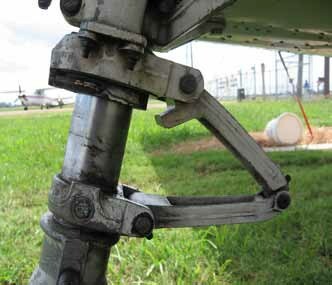 We have frequently removed the nose gear scissors looking for the source of free play and find bent bolts. It’s so expected we just keep a good supply of these bolts in stock. The upper torque link is a different matter. When the strut fully extends, there is a block mounted on the upper torque link that acts as the extension limit. The stop block also forces the nose gear to lock in the center position when the strut extends in flight. Unfortunately, the geometry of the upper torque link and its stop block put a large bending force at the middle of the link. It’s not a matter of if, but when the link will bend. As the link bends, the strut will extend farther than it is designed to. On the non-retractable gear planes, like our 182, the bending of the link isn’t really the problem. The real concern is when the bend becomes a break. There is a snap ring that “should” keep the strut from departing the airplane, but there’s nothing that will steer the nose gear. Assuming the strut stays with the plane, the strut will stay centered as long as it is extended. All bets are off once the strut compresses after landing. There’ll be no directional control, no hint which way it will turn, no idea how far it will turn, and absolutely no indication to the pilot that any of this is about to happen. One alternative to the cost of having the eddy current testing performed on the upper link is to replace the part. If a crack is found, you’ll have to replace it anyway. New links are available from Cessna from $1,281.00 to $1,841, depending on the aircraft serial number. One could expect to pay about 40% of list price for a serviceable part on the used market. Inspection of the wing attachment carry-thrus is an operation CPA has been encouraging for years. It’s one that should already be a part of every annual inspection by a Cessna knowledgeable inspector. Corrosion in the top of the cabin is a long known issue on our Cessnas. As the planes sit in storage, atmospheric changes create a certain “green house” effect that sends moisture and other chemicals from the upholstery to the bare aluminum in the top of the cabin. We’d also like to inspect inside each of the carry-thru channels, but there’s no easy access without removing a wing. The actual inspection time is pretty short, but proper viewing may require removal of the headliner. On most planes, the age and frailty of the headliner can turn a routine event into a more expensive upholstery job. This inspection requires some effort to see all the areas in question. The area around the wing strut attach points are very critical, and any defect will warrant immediate action. The + on the labor for this SID is because the inspection likely leads to a modification as recommended in SEB95-19. SEB95-19 calls for installation of service kit SK182-115 which includes enlarging several floor access holes, then installing some pretty major structural enhancements to the forward door post bulkheads at the lift strut attachment area. We’ve not found any cracks in these areas yet, but it will eventually happen. Installation of SK182-115 is a pretty major event, and we’ll give a detailed accounting of the first one we do. SK172-147 is the same reinforcement kit for the 172 series and SK210-156 applies to the strutted wing 210 series. 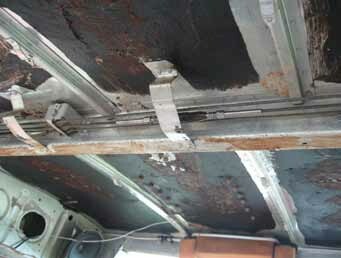 The corrosion of the cabin skins under the sound deadening panels is a well-known problem and has been a significant part of the Systems & Procedures courses since their beginning. These panels are glued on almost all the cabin skins as a method to reduce vibration of the skins. The problem is the adhesive is hydroscopic, meaning it retains moisture, which in turn promotes corrosion. The solution is to remove these panels and treat the aluminum with a corrosion inhibitor. If that sounds simple, then you’ve never tried to remove one of these panels. I’d almost prefer scraping sealant out of a wing tank than getting panels loose. You can try chemicals to dissolve the adhesive, but the exposed surface area is so small that it’s a losing battle. Tenacious use of a non-metallic scraping tool is about the only effective method. This is work that can be performed by a willing pilot/ owner to save a great deal of shop expense – think upwards of 50 man hours. Getting the sound panels off is just what must be done for access to the skins for the inspection. The truth is that the more difficult the panels are to remove, the less likely there will be damaging corrosion found under them. 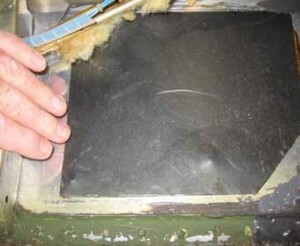 The presence of corrosion actually separates the panel from the skin. 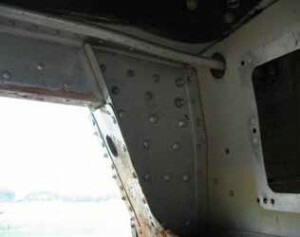 The worst case is that the panel has already fallen off and corrosion extends deep into the skin. Approximate Labor Time – 2 hours plus eddy current work. The vertical fin attachment area design is common to almost all the larger single engine Cessnas with the swept tail. This includes the 182, 205, 206, 207, and the 210. The aft tail cone bulkhead cracking is another well-known issue that should be easily detected by routine visual inspection. Cessna’s inclusion of this more elaborate inspection indicates basic inspections weren’t being done as they should or weren’t effective. As with a few of the SIDs, this one has a reoccurring inspection using eddy current. There is also an option to install a kit that is terminating action for the SID. The cost to find a shop with eddy current may quickly make installing the kit a more viable option. SEB99-12 refers to installation of service kit SK210-161. SK210-161 installs several structural enhancements to aft bulkhead and a much larger vertical fin rear attachment plate. This is not a minor upgrade but would likely pay off after just a couple of the bolt hole eddy current checks. There would also be a significant increase in one’s confidence with the vertical fin attachment structure. We have eleven more SIDs to go through. As we have occasion to install some of the service kits, we’ll make more detailed reports on those processes. So far, we’ve not found any of these inspections to be frivolous or unnecessary. Most any mechanic familiar with the Cessna line should find every one of the SIDs to be known items and have probably been paying special attention to them during routine inspection. The big difference now is that Cessna has formalized the inspections and attempted to standardize the reactions.